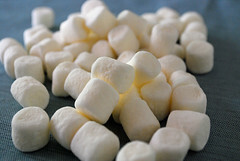 Have you heard of The Marshmallow Study? It’s a classic experiment in self-control. All kinds of longitudinal research was conducted on those who weren’t able to “control themselves” and wait for the second marshmallow. In fact, there was even a movie that adapted the crux of the marshmallow experiment and used it as part of the plot. When juxtaposed, my interpretation of the results of the original experiment from 1972 and the one discussed in the video is, quite simply: context matters. This entry was posted in Psychology, Science and tagged Context, Externalities, System, Unintended Consequences. Bookmark the permalink.